« Madison calling Budapest: Can you read me? In the 1990s and 2000s, American cinema was hit by a rash of fancy storytelling. Filmmakers experimented with flashbacks, replays, shifting points of view, multiple universes, network narratives, and a host of other unusual devices. (Some prototypes: Pulp Fiction, The Usual Suspects, Memento, and Short Cuts.) These developments nudged me into analyzing the trend in The Way Hollywood Tells It, but my interest in such tricky narration goes back to my adolescent love of detective fiction and the stories of Henry James, Faulkner, and James Joyce. For me, mysteries and modernism went together. That was especially true of 1940s movies, which I now realize loom large in my film consciousness. 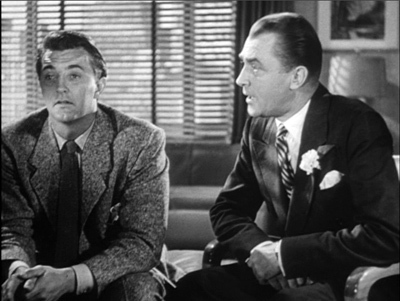 Many of the fractured, densely plotted movies I wrote about at length in Narration in the Fiction Film, such as Murder My Sweet, The Big Sleep, In This Our Life, and The Killers, come from the same era as Citizen Kane and How Green Was My Valley. So do subjects I wrote about later, such as Mildred Pierce and Rope and network pictures like Weekend at the Waldorf and Tales of Manhattan. This summer I face up to my proclivities and give a batch of lectures under the rubric “Dark Passages: Storytelling Strategies in 1940s Hollywood.” The series, accompanied with ten screenings, is part of a “Film College” to be held in Antwerp under the auspices of the Flemish Service for Film Culture and the Belgian Cinematek. I first wrote about this “summer movie camp” here. I probably shouldn’t have called it that; I still get emails from services that sell canoeing gear and organize outings to the Poconos. Starting to think about this course has given me more ideas than I can pursue in seven lectures, so in the weeks to come don’t be surprised if some chips from the workbench get swept up here. Even if you merely like the 1940s for those gleaming cigarette cases and those fashion shoulders that seem to have been designed with a carpenter’s level, we can enjoy some rather tricky pieces of movie storytelling. 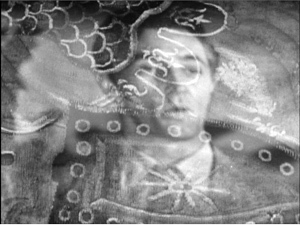 During the early 1930s American studio filmmakers experimented considerably with flashbacks. (I write about that trend here.) Several associated conventions, such as the dissolve-plus-music, as well as the track-in to a narrating or remembering character, seem to have been installed then. But in the 1940s, the flashback became a more wondrous thing. As flashbacks proliferated, they got weirder. Films gave us flashbacks retelling events from different characters’ perspectives, flashbacks that proved deceptively incomplete or downright false, even flashbacks narrated by corpses. Then there was the embedding option: setting a flashback within an already-established flashback. Here’s an example. 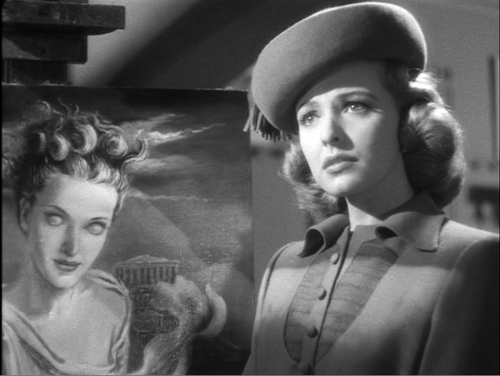 In Shoot to Kill (1947), Marian Dale is brought into the hospital from a car crash and is pumped by a reporter anxious to get her story. The narration flashes back to happier times, when the reporter introduced Marian to Larry, the new district attorney. When Larry takes her to dinner, Marian explains how she came to find him attractive. Now a further flashback shows her listening raptly to Larry’s aggressive prosecution of the case against mobster Dixie Logan. Coming out of this flashback, we’re back in the restaurant, and flirtation continues between Marian and Larry. At later points we’ll come out of that earlier time frame back to the present, with Marian and the reporter in the hospital. This sort of embedding is an obvious option, but let’s go to the next level. What about a flashback within a flashback that’s already nested inside another flashback? Or even, gulp, flashbacks within flashbacks within flashbacks within flashbacks? Do the math. The result is like the famous Chinese boxes or Russian dolls, with one story held within another, which is held within another, and so on. Many of the strangest narrative experiments of the 1940s are to be found in B films. Perhaps in that domain the demand for novelty and rapid turnover is greater and the constraints on plausibility, or even just good sense, are fewer. Shoot to Kill, an independently produced B-item, would seem to be an example, though it’s not as wild as The Sin of Nora Moran (1933), my candidate for America’s most peculiar flashback movie. Surprisingly, though, the multiply-embedded flashback is most prominent in two high-profile films of the 1940s. How could I talk about them without spoilers? Flashbacks are often presented as solutions to a mystery: we go back to the past to learn how or why something took place in the present. Passage to Marseille (1944) opens with Manning, a war correspondent, visiting a camouflaged air base in the English countryside. From here Free French pilots launch bombing raids on Germany and occupied France. Struck by the intensity he sees on one gunner’s face, Manning asks his host Freycinet about the man’s past. Freycinet answers with “the story of a little group of whom Matrac was one.” That is the first layer, or the surrounding box. Aboard the Ville de Nancy: We go back a few years to a French cargo ship carrying nickel ore to Marseille. Freycinet, traveling on orders, runs into conflict with the right-wing Major Duval and his coterie. The ship rescues five men from a drifting boat. Are they prospectors, as they claim? Soon Freycinet realizes that they are convicts, escaped from Devil’s Island. They start to explain how and why they got away. Devil’s Island: We see the men plan to escape, but these convicts don’t simply want freedom. They are patriots who yearn to fight the Germans. But one, Matrac (Humphrey Bogart), sits apart from the others and won’t explain himself. Why? Another member of the team, Renault, explains. France, 1938: Daladier returns from Munich with news of an accommodation with Hitler. Matrac, a crusading reporter, is disgusted and writes scathingly of this sellout to Nazidom. His newspaper office is smashed by right-wingers while police and citizens look on. Disabused of his faith in France, Matrac seizes the chance to flee with his lover Paula. But he is arrested, tried on trumped-up charges, and sent to Devil’s Island. 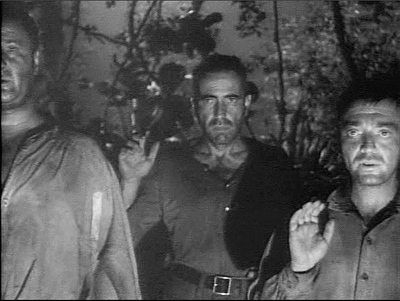 Devil’s Island: After Matrac has been let out of solitary confinement (where he shouted, “I hate France!”), the five men escape from the prison camp. The old man who helps them asks only that they promise to serve French freedom. But Matrac refuses to recite the pledge (above). The new mystery becomes: What has turned him into the loyalist gunner that Manning sees in the opening scene? Aboard the Ville de Nancy: On the ship, word comes that Marshall Pétain has signed an armistice with the Germans. The captain secretly swerves the ship from Marseille, a Pétain-controlled city, and sets sights on England. But his ruse is discovered by Duval, whose men seize the ship. A fight ensues, with the crew and the Devil’s Island brigade pitted against the pro-German officers. Soon a German bomber arrives to sink the ship, but only after Matrac assures the dying cabin boy that they will drive the enemy out of France. In Passage to Marseille, Matrac’s 1938 adventure forms the core, wrapped in three layers. We have a flashback within a flashback within a flashback, itself surrounded by a frame story set in the present. The whole action takes place across about six years. Why tell the story in this complicated way? Because, I think, it enhances mystery. The initially formulated mystery is vague, revolving around Manning’s inquiry about the charismatic Matrac, but other questions get more specific. What led these five men to near-death on the open sea? Are they really gold prospectors? Why does Matrac sit sullen while his comrades explain their patriotism to Freycinet? What has made him so bitter? And since we know from the start that he has become a committed patriot, what led him away from his solitude? These aren’t the sorts of questions you get in a classic detective story; they focus on personal psychology and character change. A more linear story tends to give us motives straightforwardly, and it explicitly traces the process of people changing their minds and hearts. The broken timeline creates more curiosity as we are led to ask why people do what they do. These are puzzles of personality. The film thus gains a double propulsion. We have the usual forward movement, the rhythm of anticipation hinging on the question: What will happen next? But the mystery element adds curiosity about the past, asking: What led up to the situation of crisis that we see now? This double movement is seen in many 1940s films, which in retrospect (my own flashback here) may be one reason I turned to that era in exploring storytelling options in my narration book. When we encounter embedded flashbacks, the plot often treats the core, or innermost layer, as the ultimate secret, the source of what teases us in other layers. 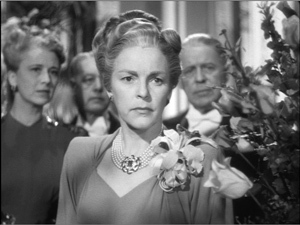 Like Passage to Marseille, The Locket (1946) turns on a puzzle of character: Is the beautiful and charming Nancy exactly as she seems? We find out when we witness a childhood trauma located in the center of the plot’s geometry. It’s the wedding day of John Willis. While his dazzling bride-to-be Nancy beguiles the guests, John is called away to meet Dr. Blair in his study. Dr. Blair has come to warn him: Nancy is “hopelessly twisted.” He explains…. Some years earlier: Nancy and Blair meet, fall in love, and marry. With a lovely wife and a flourishing psychiatric practice, Blair couldn’t be happier, but one day a young artist, Norman Clyde, visits his office. Norman tells him that Nancy could be charged with murder, and she must act to save the life of a man about to be executed (image above). He explains…. Earlier: Nancy is visiting Norman’s studio for an art class, and soon they’re involved in a romance. Her boss Andrew Bonner is a patron of the arts, and she calls his attention to Norman’s work. After a party celebrating Norman’s recent success, Norman finds that Nancy has stolen another guest’s expensive bracelet. He asks her why she did it, and she explains…. Childhood trauma: Nancy is ten, and her mother works as a servant for a wealthy family. The daughter of the house, Karen, is Nancy’s best friend. Karen gets a diamond locket for her birthday, but she gives it to Nancy. When her mother finds out, she takes it back and upbraids the girl. Later Karen’s locket is missing. Although it simply went astray, Karen’s mother brutally forces Nancy to confess that she stole it. Nancy and her mother are dismissed from the household. Back in Norman’s studio, he points out that Nancy’s stealing the bracelet at the Bonners’ party was her effort to get even with Karen’s mother. Nancy swears to never steal again, and he anonymously mails the bracelet back to its owner. Later, at another art-crowd party at the Bonners, Norman is looking for Nancy when he hears a gunshot. Upstairs, he finds Nancy running down the corridor while a maid discovers Bonner’s body. Later, Nancy denies killing her boss, and Norman agrees to conceal what he saw. But he’s tormented by the fact that a manservant is now the chief suspect. Claiming that he’s too suspicious of her, Nancy breaks off their affair. Back in Blair’s office, Norman begs Blair to induce Nancy to confess and save the servant, who’s to be executed tonight. Norman visits Blair and Nancy, who admits their old affair but denies killing Bonner. The next day, with the servant now executed, Norman flings himself through Blair’s office window and falls to his death. Shaken, Blair returns to England, where he and Nancy take up the war effort. When a bomb is dropped on their own street, Blair searches the rubble of their apartment and finds jewels that have gone missing from the collection of an acquaintance. Nancy turns up unharmed, but Blair has a breakdown and Nancy leaves England. Back at the wedding: John remains skeptical, especially after Nancy comes in. She smilingly admits knowing Blair, but says he was only her psychoanalyst. She points out that he cracked up in London and was recently released from an asylum. Having renewed John’s trust, she goes to meet his mother, revealed as well to be the mother of Karen, her playmate of long ago. We now understand that Nancy is marrying into the family that had cast her out as a child. Karen has died, and her mother fastens Karen’s treasured locket around Nancy’s neck. Trying to brazen through the ceremony, Nancy is assailed by memories of her childhood and her crimes. She becomes dizzy, screams, and faints. As she’s taken to a sanitarium, John decides to go with her, adhering to Blair’s last bit of advice: “Lockets are only symbols. It’s love she needed–and love she needs now.” Maybe she isn’t as hopelessly twisted as he had initially said, or as the plot itself seems to be. 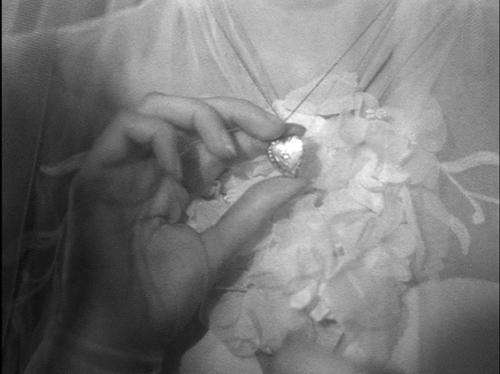 Hitchcock’s films Spellbound and Marnie saved the revelation of childhood trauma for the climax, but The Locket doesn’t do that. Nor does the scene come at the exact center of the running time, as the plot geometry might suggest. 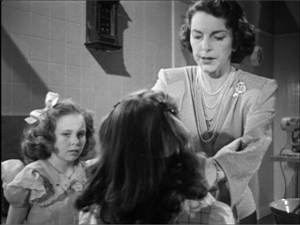 The childhood scene arrives at the sacred twenty-five-minute mark, after Nancy’s confession to Norman that she stole the bracelet at the Bonners’ party. The plot thus emphasizes the aftershocks of Nancy’s childhood, creating suspense about whether she can continue to hide her trauma. Someone versed in modern literature might ask: But can we be sure that we now know her trauma? Her confession to Norman is embedded in the tale Norman tells Dr. Blair. He is a somewhat unbalanced fellow, rude, proud, and inclined to do rash things. “Why,” he asks in his voice-over, “was I always throwing away the very things I wanted?” And of course his tale is embedded within the story Blair tells John Willis, the prospective bridegroom. By the end of his time with Nancy, Blair is a nervous wreck; he could be delusional. In literature, we might well suspect a trauma that has made its way through three filters (adult Nancy-Norman-Blair). This possibility is accentuated by the film’s unusual adherence to each character’s range of knowledge during each flashback. We know pretty much only as much, in turn, as the child Nancy, Norman, and Blair know. Most classical flashbacks roam more freely outside the recounting or recalling character knew, or could have known. The Locket‘s restriction to each man successively optimizes the mystery of grown-up Nancy. But the strategy also offers no outside validation that what each man tells us actually happened. With no external or objective scenes of Nancy doing vicious things, the film locks us within what could be wholly hallucinatory tales. Classical Hollywood film doesn’t try to undermine us so thoroughly, though. However modernist the multiple-narrator format of the film looks, the implications for reliability aren’t as unsettling as in literary works like The Sound and the Fury. The conventionally realistic style of most of the film makes it difficult for us to imagine layers of lying. We’re most likely to take what see and hear as veridical, unless there are explicit clues (as in, say, the landscapes and plot twists of The Cabinet of Dr. Caligari) to ask us to ask whether what we’re seeing is unreal in the fiction. What actually ensues is a drama of crafty concealment. As the evidence piles up against her, the question becomes: How will Nancy outwit her man this time? 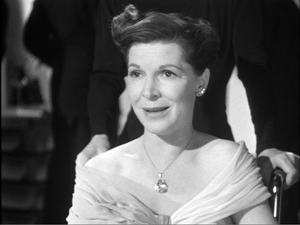 This maneuver is especially significant in the film’s last third, when Blair suspects that she has stolen jewelry from Lord Windham’s collection. He tries to peek into her purse, but when she finally shakes out its contents, the missing locket isn’t there. He is relieved, though his suspicions continue to prey on his mind. We have to wait too, but when Blair finds the necklace in the apartment wreckage, we’re hardly surprised. Everything we see has been actual; we must doubt Nancy, not the narrators. Even in the men’s stories, the film drops a few hints that Nancy isn’t what she seems. At one point, the camera lingers on her after Blair has left her in their London apartment. As she closes the curtains for the blackout, she crouches and looks askance in the classic posture of the guilty one. (On re-viewing, we might take this as suggesting she was looking off at the real hiding-place of Lord Windham’s locket.) Earlier, when she starts to tell Norman of Mrs. Willis’ abuse of her, she turns from him and looks at the camera, as if asking us to believe her. Above all, there is the linkage of Nancy with Cassandra, the suffering madwoman of Greek mythology who was notoriously ignored by those she tried to warn. She had the gift of prophecy, but that quality seems denied Nancy. The prophetess we meet in the movie is a horoscope reader at the wedding, and she supplies banal and contradictory predictions. 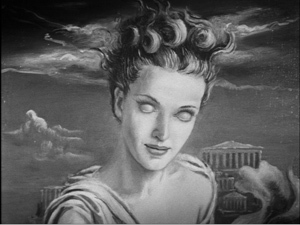 More telling, and spooky, is the fact that the Cassandra of the film is seen in Norman’s painting, and her eyes are filmed over, blank and presumably blind. 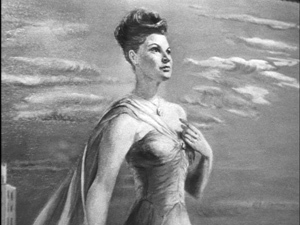 This image is counterposed to the portrait Norman later paints of Bonner’s wife. She is confined to a wheelchair but on the canvas, she is presented as majestically erect and possessed of a penetrating glance. The blind Cassandra seems scarily oblivious to her madness, while this painted mother-figure seems all-seeing. It’s no great reach to consider her a variant of Karen’s mother, who tormented the young Nancy and who comes back at the end as another, less serene incarnation of Norman’s second painting. In sum, the prophetic quality of the heroine’s namesake is taken over by the film’s overall narration, which makes sure that everything that is planted early (the locket, the painting, a music box, the mean Mom) comes back with a relentless logic at the end. But we shouldn’t forget that the Cassandra of legend was repeatedly raped. If she’s mad, men helped make her that way. The film is as much a study in male neurosis as in female frailties. Behind the swagger and insults, Norman is insecure, and he ends his life spectacularly. Earlier he had told Nancy: “If I had to relive these past few weeks, I’d kill myself.” As for Dr. Blair, on the strength of a single encounter, he smugly diagnoses Norman as “a paranoiac with guilt fantasies.” Yet he forgets that Norman told him about the partygoer’s missing bracelet, as if his wife’s childhood loss of the locket erased his awareness of what led her to tell it. After a few years with Nancy and the blitz, he’s the one who ends up in an asylum. Unlike the stalwart heroes of Passage to Marseille, Nancy’s men trace no smooth character arc. The fragments given us in Passage can be swiftly reassembled. We understand that characters can change, and we expect that the film will trace out the men’s survival, especially after the opening establishes their successful bombing missions. We also note that Matrac is played by Bogart, and anyone who caught Casablanca (released fifteen months earlier) could see his change of heart coming from far off. Nancy: Yes, it was ghastly. You ought to see it, Harry. It’s about a schizophrenic who kills his wife and doesn’t know it. Blair, laughing: I’m afraid that wouldn’t be much of a treat for me. Blair: Darling, do you mind? You can tell me later. Nancy’s father, she told Norman, was a painter like him, but he failed, and he is already dead when we see her as a child. In the popularized Freudianism of the 1940s, perhaps Nancy lacks the firm guidance of a strong male; certainly her kindly but ineffectual mother isn’t much help to her. But then neither are these supposedly grown-up men. During Nancy’s hallucinatory march to the altar, music and dialogue and visual moments from earlier in the film collide and overwhelm her. But this is merely the climax of the inward bent of The Locket as a whole, which contains almost no exterior scenes. We might be tempted to attribute this interiority to the old standbys, wartime trauma and postwar malaise. The subjective sequences could be put down to the resurgence of Expressionist style, purportedly under the influence of German directors and technicians who fled to Hollywood. So far, so familiar. I’m inclined to see a different dynamic at work. What if the stereotypes of situation and imagery sprang not from a Zeitgeist or localized influences? What if current themes and trends were exploited by filmmakers aiming for a more complicated sort of storytelling that still adhered to the models given by tradition? For reasons I hope to explore in my lectures and in some blog jottings, I think that many American filmmakers aimed more or less deliberately to revise Hollywood narrative norms in fresh, sometimes startling ways. In their urge to shake up their audiences, writers, directors, and others competed in pushing the envelope, straining the premises further as the decade went on. Why not a blind Cassandra or a mixup of mother-figures? Why not tell a story from a corpse’s point of view? This enterprise gave us many fresh, even shocking films, but they risked incoherence. You see it in the resort to amnesiac heroes, to savage dreams, to perfunctory or downright inconsistent endings, to angels who might rescue us, to moments that repeat or condense or contort other images scattered across the movie, like the queenly mothers and blind prophetess of The Locket. When a producer is ready to leave decisions about flashbacks to the editing stage, you shouldn’t be surprised by gaps and disparities. Still, even if a movie gets hopelessly twisted, it can provide a creative play with storytelling options. Or so I’ll try to show from time to time in the next few months. An earlier entry discusses the cycle of early-1930s flashback films. The quote from Philip Scheuer comes from James Naremore’s subtle and informative More Than Night: Film Noir in Its Contexts, 2d ed., 2008, 17. The quotation from Seymour Nebenzal, producer of The Chase, appears in “Hollywood Inside,” Variety (16 September 1946), 2. The finished film did drop the novel’s flashback, but something more peculiar was put in its place. (That’s a whole other blog.) The Paradine Case review is quoted in an advertisement for the film in Variety (15 January 1948), 3. My outline of Passage to Marseille simplifies the plot architecture just a little. The first Devil’s Island block is actually two chunks, a brief one introducing a few of the team, followed by a return to the narrating situation on the ship, and then followed by much lengthier set of scenes on Devil’s Island. The logic of the “sandwich-structure” flashbacks remains intact, though. 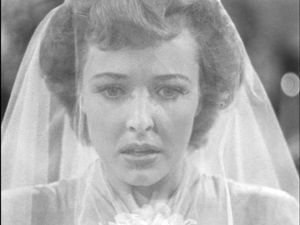 Barbara Deming’sRunning Away from Myself: A Dream Portrait of America Drawn from the Films of the 40’s, pp. 23-25, fits the iconography and narrative reversals of Passage to Marseille into a wider trend of wartime patriots who, apparently having cast off their cynicism, make commitment to the cause seem a new form of their earlier despair. The embedded-story strategy is a recursive one. How many levels can a viewer handle before confusion sets in? I raise the problem in discussing Inception here, and I mention Robin Dunbar’s suggestion that five layers is the limit most people can follow. The 1940s films I discuss in this entry have four, counting the framing situations, but Inception pushes the limit with its five. An informative history of nested boxes, dolls, and the like across cultures can be found here, the source of my array of caskets in the illustration above. P.S. 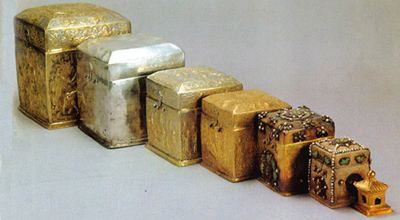 8 June: William Benzon, of the vivacious site The Valve and the blogsite New Savanna, has written to point out that what I’ve characterized as boxes-within-boxes belongs to a broader tradition known as ring composition. It is an ancient literary technique that can operate at many levels, from that of plot down to a passage of a few lines. The essential feature is that the components are arranged in that ABCDCBA pattern. Ring composition has been analyzed by Mary Douglas in Thinking in Circles, and Bill has written about it here. Thanks to Bill for reminding me! This entry was posted on Monday | June 6, 2011 at 11:17 am	and is filed under 1940s Hollywood, Film history, Hollywood: Artistic traditions, Narrative strategies. Responses are currently closed, but you can trackback from your own site.